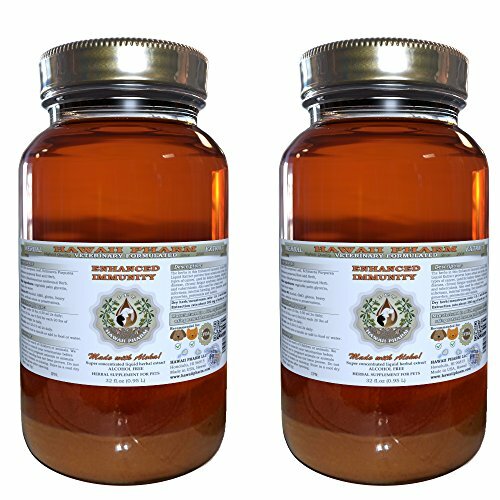 This Enhanced Immunity Veterinary Natural Alcohol-FREE Liquid Extract made from organic or wild harvested Dried Olive Leaf, Echinacea Purp Root and Herb, and Eleuthero Herb. Olive is used to prevent heart attack and stroke (cardiovascular disease), rheumatoid arthritis, and migraine headache. Siberian ginseng is used for kidney disease, Alzheimer's disease, attention deficit-hyperactivity disorder (ADHD), chronic fatigue syndrome, diabetes, fibromyalgia, rheumatoid arthritis, flu, colds, chronic bronchitis, and tuberculosis. It is also used for treating the side effects of cancerchemotherapy. Goldenseal is used for urinary tract infections (UTIs), internal bleeding, bleeding after childbirth, liver disorders chronic fatigue syndrome (CFS), jaundice, gonorrhea, fever, pneumonia, malaria, whooping cough, and an eating disorder called anorexia. Any statements on this page have not been evaluated by the Food and Drug Administration. This product is Herbal Supplement and is not intended to diagnose, treat, cure or prevent any disease. We recommend that you consult with a qualified veterinarian before using this or any other herbal products. This Enhanced Immunity extract made from the natural highest quality human-grade Dried Olive Leaf, Echinacea Purp Root and Herb, and Eleuthero Herb. Other ingredients: vegetable palm glycerin, crystal clear water. Hawaii Pharm Enhanced Immunity Pet Supplement contains no GMO, gluten, heavy metals, artificial colors, preservatives or synthetic fertilizers! Super concentrated Enhanced Immunity Veterinary Natural Alcohol-FREE extract: dried plant/ solvents ratio is 1:3! 1 ml of our glycerite is approximately equal to 300 mg of dried plant. Enhanced Immunity Pet Herbal Supplement is 100% drug-free and non-addictive natural Glycerin based liquid formula proudly manufactured in the USA, Hawaii to ensure highest quality of the product! Suggested use: For dogs under 20 lbs, use 0.5 ml daily; for dogs over 20 lbs, use 0.5ml for each 20 lbs of the dog's body weight daily; For Cats, use up to 0.25-0.5 ml daily. Squirt directly into mouth or add to food or water.